Among Poles, the descendants of post-WWII forced migrants today have higher average education and incomes than those whose ancestors were not displaced. It has long been theorized that people who are forced to migrate invest heavily in education, a portable asset that will not be lost if a second expulsion occurs, and that this pattern persists for generations. But this hypothesis has been difficult to test because there are often confounding factors that affect forced migrants. They frequently differ from natives of their new homeland in characteristics such as ethnicity, language, and religion. In Forced Migration and Human Capital: Evidence from Post-WWII Population Transfers (NBER Working Paper No. 24704), Sascha O. Becker, Irena Grosfeld, Pauline Grosjean, Nico Voigtländer, and Ekaterina Zhuravskaya avoid the usual confounding factors by studying the descendants of Poles who were expelled from Kresy, the eastern borderlands of Poland, when the Soviet Union acquired that territory in the aftermath of World War II. Those Polish forced migrants were resettled to central Poland and into the newly acquired Western Territories of Poland, which were taken over from Germany. Thus, Poles from Kresy subsequently lived with other Poles who were not forced to migrate, and who had the same ethnic, linguistic, and religious background. The researchers find that on average, the descendants of the Kresy Poles are today significantly more educated than the descendants of other Poles. Averaging across the children, grandchildren, and great-grandchildren of the Kresy migrants, they find that descendants of the forced migrants have received one additional year of schooling. This finding holds even within municipalities, when comparing neighbors with and without roots from Kresy. The researchers point out that the Polish Kresy population was less educated than other Poles before the war, so the more recent pattern represents a reversal of the historical one. They consider, but reject, the possibility that differential out-migration, selection into destinations, fertility, or labor market congestion could explain the higher education of descendants of those forced to migrate from Kresy. In addition, the findings hold within a narrow corridor around the hypothetical Kresy border. The study uses data from the Diagnoza Survey, Poland's primary survey of the conditions of Polish life, supplemented with an ancestry survey that the researchers conducted in 2016. The survey gathered data on over 13,000 ancestors of 4,069 Poles living in Poland's Western Territories. The descendants of forced migrants from Kresy are the most educated sub-group of Poles. They are followed by descendants of Poles who voluntarily moved from central Poland to the largely empty Western Territories after World War II. This suggests that forced migration has a stronger impact on the desire to invest in education than voluntary migration. 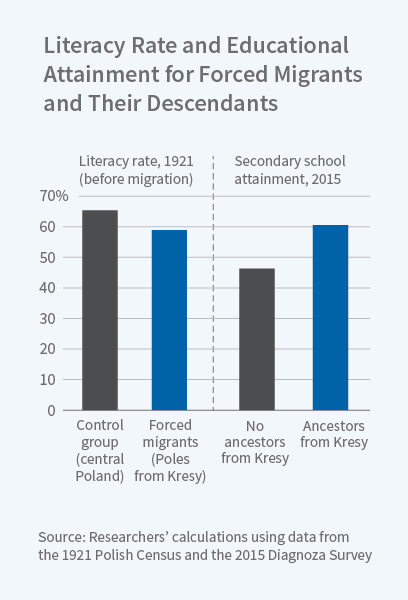 The descendants of Kresy migrants are 12.7 percentage points more likely to finish secondary education and 9.9 percentage points more likely to graduate from college than other Poles. In response to a question from the Diagnoza Survey about parents' aspirations for the education of their children, respondents with Kresy ancestors scored higher than those whose ancestors were not from the Kresy region. Descendants of Kresy migrants today have roughly 10 percent higher incomes, are more likely to have white collar occupations, and are less likely to be unemployed than other Poles. Respondents with Kresy ancestors are significantly less likely to believe that material goods determine a successful life, and they own fewer assets than other Poles, even when they have the means to purchase them.